I've always enjoyed making tikis. No real reason, 'kinda crude, quick to make and something elemental about their look. Their are lot's of different kinds of tikis. 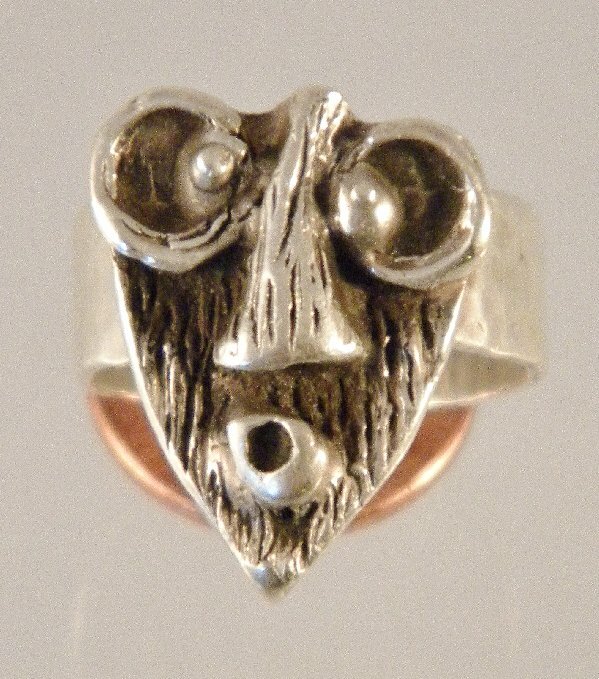 This tiki is crudely(but securely silver soldered) mounted onto a sterling silver ring. I did the original in wax and cast it using the lost wax casting method. I fastened it temporarily to a penny for the photo so you could get a sense of the size. 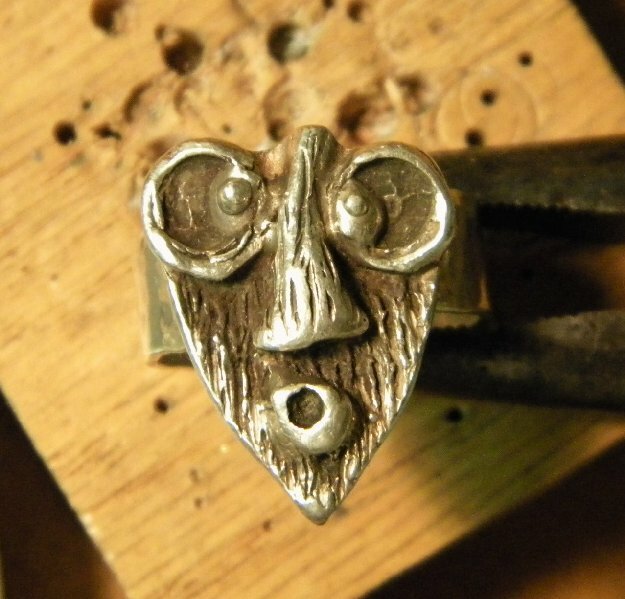 It's not the biggest ring I ever made, but it's a pretty substantial ring and could quite probably be termed a miniature brass(well, silver, really) knuckle. 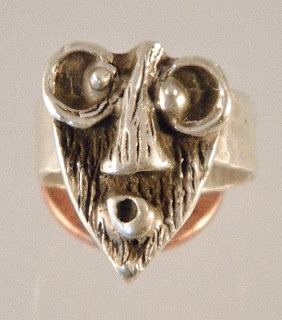 Another shot of it, fresh from casting it and soldering on the ring. I can make any size, bigger smaller, as a pendant, etc, just let me know the size you need and necessary particulars. The price of this one is $125.00, shipping is included, and it comes in a small gift bag. The next one is another cast tiki, but done in pewter and is definitely heavy enough to be a dangerous weapon if swung about. You can read about the making of it at casting a tiki. I did the original in clay first and then did the work to make a mold so I could cast it in pewter. I could also do this in silver, it would just cost quite a bit more. Being a tiki, it is guaranteed to bring good luck, keep you free from zombies and prevent errant badger attacks. Let me know if it does not work in this fashion, and I will cheerfully refund your entire purchase price! I took the photos above with different backgrounds so you could get a sense of the size and color. It's pretty shiny. I've strung it on a black cord, but that could be changed easily if need by me or by yourself. It's $25.00, shipping included, and it comes in a cloth gift bag.